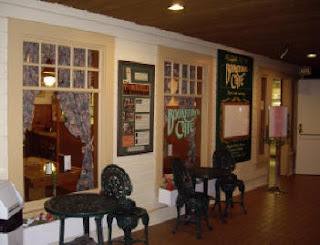 The Boomtown Café is a fantastic place to meet up with a group of parents and kids for a yummy breakfast, lunch or snack before during a visit to the Western Development Museum. The 1910 era decor and freshly made specials give it a homey feel. There are high chairs and boosters available in the restaurant and a change table and toddler-accessible sinks in the WDM washrooms across the hall. Meals are ordered cafeteria-style, and there are plenty of foods to make the kids happy. Hot dishes will be brought to you in a fairly quick turn-around. And when I say hot, I mean hot! Most of the time we are forewarned, but just in case you're not, please know the chicken fingers and fries are always super-duper hot! This is Little J's favourite meal there, and I try to be mindful to order something cool like cut veggies that he can eat while he's waiting for his meal to cool.